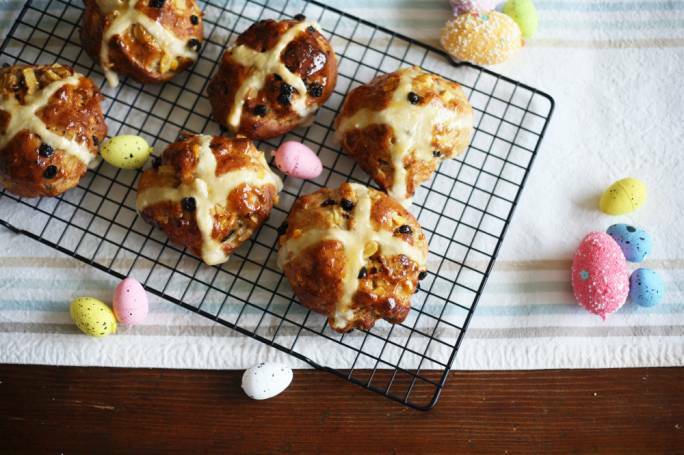 Make your hot cross buns a little healthier with this recipe that uses very little sugar, very little butter and wholemeal flour. Bring the milk to the boil, remove from the heat and place the butter in the pot. Allow to come to hand temperature. In a large mixing bowl, combine the flours, sugar, salt and yeast and make a well in the centre. When the milk has cooled enough, add the milk to the centre of the well along with the beaten egg and sunflower oil. Using a fork mix some of the flour into the egg and milk mixture, adding a little more flour until everything is combined. Bring out onto a floured surface and knead for 5 mins until smooth and elastic. Place into a slightly oiled mixing bowl and cover with a damp tea towel. Place in a warm spot and allow to rise for 1 hour until the dough has doubled in size. Punch the air out of the dough and add the currants, candied orange zest, orange zest, apple and cinnamon and mix well until all the ingredients are combined. Cover with a damp tea towel and allow to rise for another hour. Punch the air out of the dough and divide into 12 equal parts. Roll into balls and place on a baking tray lined with baking paper, leaving enough place for the buns to expand. Allow to rise in a warm spot for an hour. To make the cross, add water to the flour, 1 tbsp at a time until you get a thick paste. Place in a piping bag with a small nozzle and pipe a cross on each bun. Bake for 25 mins until the buns are golden. To make the glaze, gently warm the jam and pass through a sieve if the jam is lumpy. 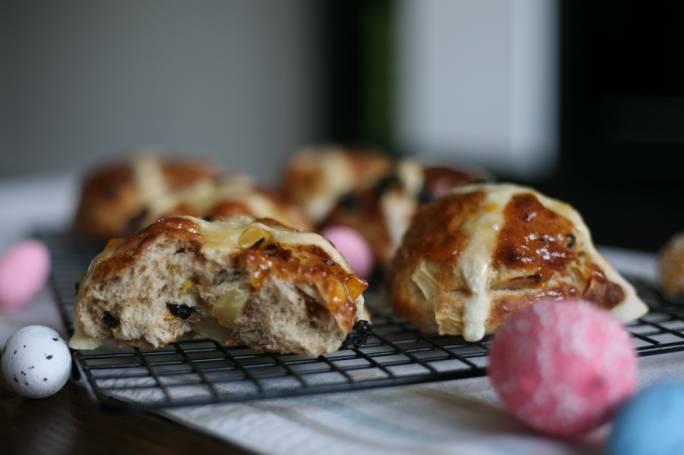 While the buns are still warm, brush some glaze over each bun and serve warm or cold, or toasted the following day.